that goes into the end of the head, the whole assembly. that comes out of the back & runs under the manifolds. You can clearly see it removed & the pipe still in place across the back of the block. But I can't workout for the life of me how. Probably due to arm shake due to lifting off the head assembly complete with manifolds turbo ect. was broken off by jameslxdt in his post. I decided to leave it in place & remove the studs from the end of the head, allowing me to remove it. You can just about make it out in the photo. As with the head off I still can't see how you can separate them. That sorted that I thought & ran it for a coupe more years like this. Checked & yes low so topped up & carried on. Head assembly complete on the bench, fresh off the car. Thought I'd better sort it while access was good. Part way through clean up! I wouldn't worry about it Just look at all them lovely pictures, that's the sort of mechanicking I used to enjoy. 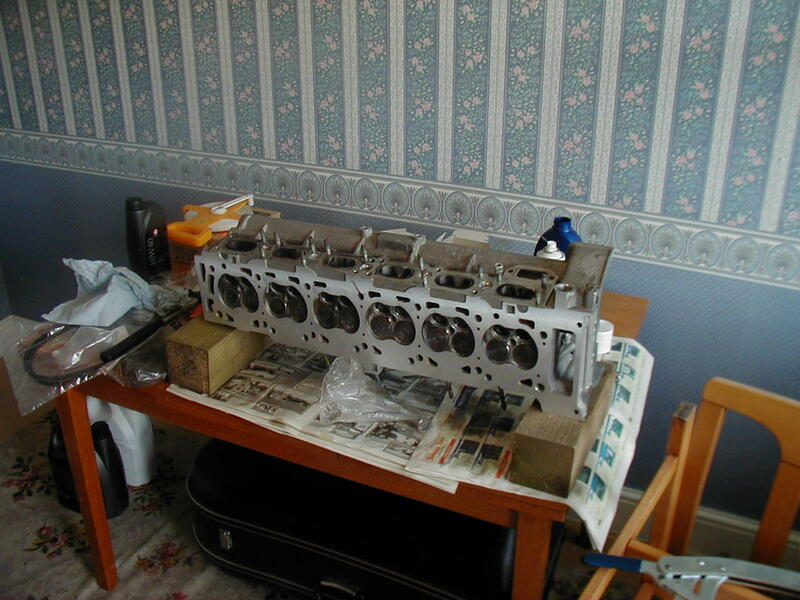 You don't see a lot of it these days, sadly gone are the days of buying a complete gasket set from a factors for little money, I think these days it would be cheaper to buy a complete car and swap the best bits over. Your improved gas flow should mean faster spooling and a crisp throttle response, I hope it made a difference and was worth while, have you fitted a new standard head gasket? Brilliant post DDD and clearly a job well done, Hopefully a good investment for the future too. Haven't done that job for many years, last one was a 2.1 XM head must be over 10 years ago. I have just fitted a thermostat to a Merc 220 diesel, pig of a job, all the fuel lines had gone hard and I broke a connection and had to make up a new pipe. Proper job that (as they say down here) I don't think I would be allowed to do mine indoors but its a lot warmer. Cost me less than £400.00 to do it including doing the turbo & a new intercooler. I bought her as a one owner car with 75k on the clock & I've looked after her & improved her quite a bit.